In order to learn more about the component parts that comprise the Safety Pays program, each game piece is featured below with a brief explanation as to the role it plays within our system. In order to learn more about how these program components are integrated together, click to What’s Included under the Program Costs section of this website. Placed in a permanent location in the workplace, the Master Game Board communicates daily updates for all current incentive game information including jackpot increases, the day’s number pick, as well as those employees eligible to win individual safety bonus dollars. Each of the two sizes of Master Game Boards offered is identical in every way except for their respective dimensions. Specially designed to match the Master Game Board wall hardware, the Display Frame is utilized for program updates during each game-round including Winner’s Circle recognition, Safety Advisories as well as upgrades and game rules changes. Designed to accommodate a letterhead sized sheet (8 ½” x 11″) sheet, the Display Frame makes virtually any document contained therein a part of the game itself! 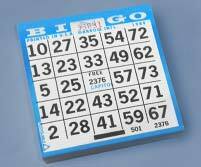 Each company employee receives a BLUE regulation bingo game card for use during a given game round. 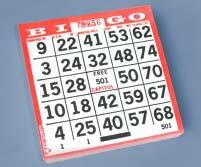 These bingo cards are distributed at the beginning of each game round and are available to all eligible players assigned to a given Safety Pays program application. Each such card is individually identified with its own ID # in the center “Free Space” to assist with record-keeping and help keep employee participants honest as to the successive cards being played throughout the year! “Bonus” bingo cards are differentiated by their RED color. This extra bingo card provides enormous flexibility allowing a company to garner individual employee attention as well as enhancing workforce cooperation. Employees who contribute suggestions during the game receive red bonus cards for additional opportunities to win jackpot and bonus dollars. 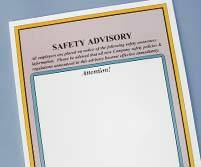 Safety Pays also provides numerous other Bonus Card uses predicated on the needs of a given company including attendance, recognition for long-term personal safety records, going “above & beyond the call of duty”, etc. Hand-sorted for accuracy, each set contains 75 bingo balls, color-coded for each letter of B-I-N-G-O. 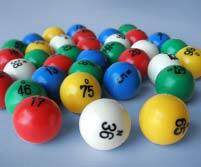 Each ball is imprinted with both the corresponding letter and number. Their acrylic composition assures durability, usually for the life of the program. This large canvas draw bag is utilized to store unused bingo balls for future draws. 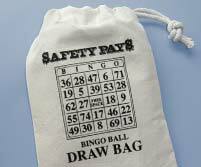 Normally, an employee reaches inside this Draw Bag and pulls out one Bingo Ball which provides the specific Bingo letter and number which becomes the “daily draw”. Made of a durable canvas material, this bag features draw strings to tie off when not in use. All dry erase markers are not created equally! 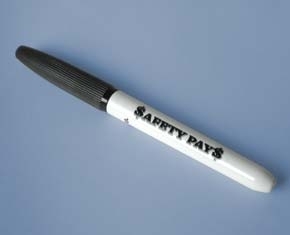 Safety Pays includes a specially designed dry-erase marker which provides a unique ink which is easily erased from the Master Game Board’s plexiglass surface. 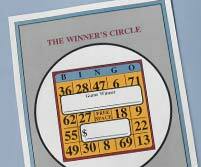 This marker is used to update the Master Game Board with each day’s updated Bingo Ball number draw as well as increase in that game’s jackpot amount and bonus play information. 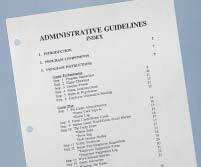 Designed for administrative ease, the Program Binder not only contains all necessary record-keeping documentation, but provides ready-access to those program components used most often. 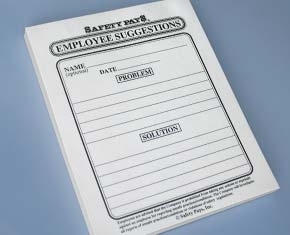 This includes employee suggestion forms, winner’s circle posters, safety advisories, safety violations, etc. There’s even a specialized “used” bingo ball receptacle inside to place the bingo balls which have been drawn until a give game-round ends. 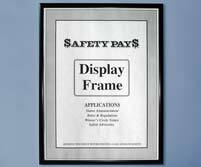 At the time the Master Game Board and Display Frame are mounted in a designated area, a Safety Pays Program Announcement is placed within the Display Frame. It’s the first “visual” a workforce is provided which broadcasts a new, fun and exciting game will soon be underway. This color poster announces both the start date for the first game round as well as any planned orientation to review the program rules with the participating employees. Used at the beginning of each game round, all employee participants will sign-in on this roster in order to receive their new game cards. Each Game Sing-In Roster also certifies in both English and Spanish that each employee has not been injured on-the-job during the previous game. 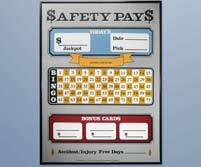 By signing for their new bingo card as well as certifying no injuries have occurred during a given game round, Safety Pays is able to promote individual employee honesty and accountability. The Game Sign-In Roster also keeps track of cards assigned via Card ID # to each employee for game & bonus play for each game-round. 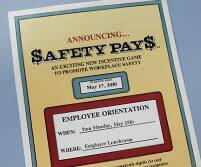 An effective safety incentive program provides both rewards and consequences. 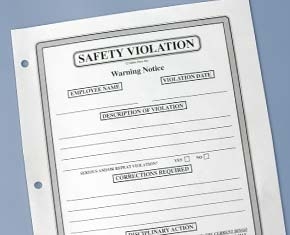 Our Safety Violation warning notices provide a much-needed “head’s up”, in writing, to an employee who is not following a Company’s safety policies or otherwise endangering himself or others through safety rule infractions. 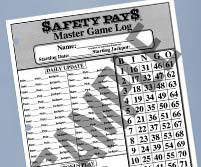 Safety Violations result in cancellation of the player’s bingo card for the balance of a current game-round. It also results in a game jackpot reduction. 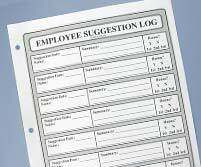 Rather than having to keep track of dozens of Employee Suggestion Forms, this easy-to-use administrative tool provides for a quick summary of each suggestion made, especially those worth of a Bonus card award as well as for future workplace implementation. All of the employee components are available in Spanish allowing every Safety Pays program to be bi-lingual. 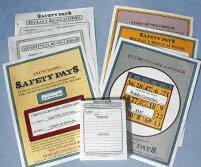 The package includes individual employee Rules & Regs as well as a color Rules poster, Safety Violations notices, Employee Suggestions Forms, Program Announcement and Winner Circle mini–posters, Safety Advisory posters, along with an extra Display Frame so all of these materials can be posted in both English and Spanish). 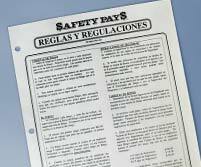 All materials are provided in the same quantities as the original English versions, included with a “Complete Safety Pays Program”. On a tight budget or just want to save a couple of bucks? Rather than purchasing the complete Spanish Translation Package, some companies opt to only have the Rules & Regulations translated. 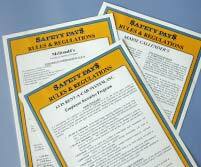 Each set includes a full set of 50 copies of the employee version of the Rules & Regs based on the specific Rules & Regulations design as provided in English. A color mini-poster of the translated Spanish rules is also included. 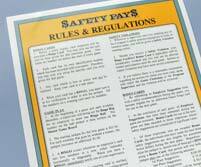 Although the Rules & Regulations we’ve designed for Safety Pays program implementation has been time-tested for over 20 years, some companies prefer to customize their incentive game rules to their own specifications. This can either be done by the customer on Company letter head as an adjunct to the existing Rules. However, some of our client companies prefer to have such changes made utilizing our graphic designs and expertise, which are available at an additional charge. Such costs include drafting the new rules with as many revisions as are necessary to meet your satisfaction as well as type-setting and printing. How does Safety Pays work on behalf of a workforce which is widely distributed among many locations (construction, janitorial, etc.) or constantly on the move (fleet drivers, temp employees, etc.). 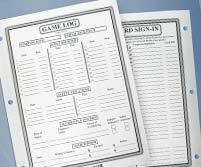 Master Game Sheets act as a disposable Master Game Board whether tacked-up at a jobsite or supply closet or part of a tailgate clipboard meeting thereby providing a handy visual reference for those employees not based at a central location.